Last weekend, I made the trek via VIA Rail down to Brockville from Ottawa for a day of fun with family. But I had to kill some time in Brockville until my family caught up to me from their trek from Toronto. Of course one of things on my list to do in Brockville was to find some lunch. On my travels along old Highway 2 (King Street as the local's call it), I spied a Domino's Pizza (191 King Street West, Brockville). I entered at 11:30 A.M. to find a quiet storefront with no customers inside. I was warmly greeted by an older gentlemen who was ready to take my order. After ordering and paying I was told the pizza would be out in about 7 minutes. I turned around and sat down to wait for my pizza to be made, baked, boxed and handed to me. I glanced around at the Domino's Pizza and locked on a television screen. No, not an interesting sports game going on or even the daily newscast. 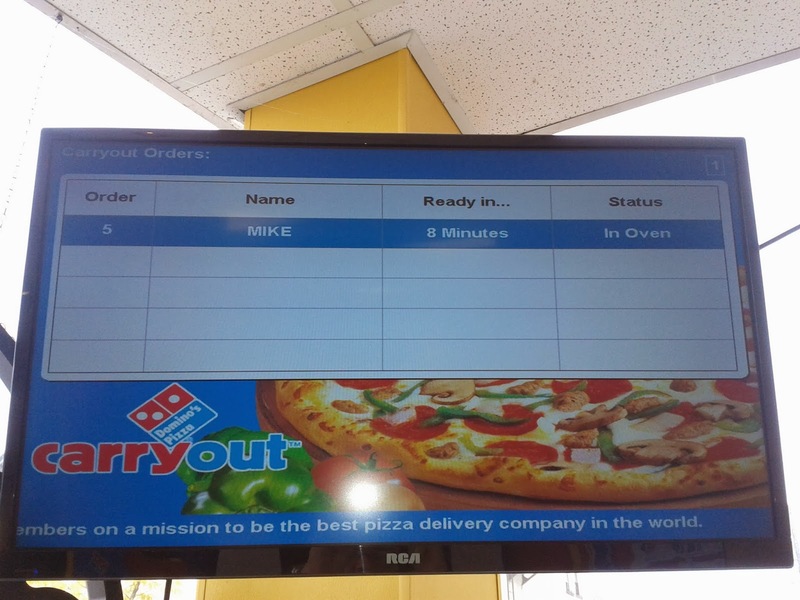 It was an order status screen with the exact location in the pizza making process my pizza was in! When I spied it first, it said it was being made and ready in 10 minutes. I grinned and pointed out to the gentlemen behind the counter the status screen was something I had not seen before and it said was at the 10 minute mark and being made. He said they had the screen for a couple of months and was currently a customer crowd pleaser. The pizza came out, boxed and ready to go right on the seven minute mark on my watch. The status screen? About 2 minutes left on it, not bad time wise and novelty screen wise too! But how would it taste? I left the store in search of a nearby park or streetside bench in the historic section of Brockville. I found a streetside bench and dug into the pizza. The pizza was cheesy with the strings of cheese splitting off as I extracted a slice from the pie. A decent amount and taste of pepperoni was also available on this pizza. No scrimping was noticed on the toppings of cheese and pepperoni. Pretty good Domino's Pizza quality right here, nothing wrong tastewise. Overall, Domino's Pizza on King Street in Brockville provides quality customer service with a warm welcome and smile from the employees. Speedy service was expected due to myself being the only customer on a quiet Saturday morning and I was not dissapointed. 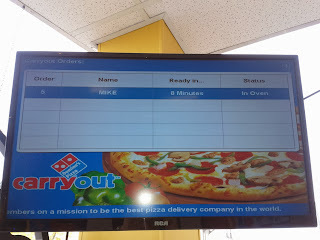 Quality chain pizza with quality service at Domino's Pizza Brockville.